Student athletes may be one step closer to compensation after a group of lawyers representing former college football and men’s basketball players told a federal court Aug. 31 they are seeking to change the fundamental way current athletes are compensated for the use of their image. In this class action, the attorneys argued money from television, video games and other products using players’ names and images should be shared with players. Look around the stadium at an Atlanta Falcons game, and you see thousands of fans wearing Matt Ryan and Julio Jones jerseys. Look around a University of Georgia game, and you will see thousands of fans wearing Aaron Murray and Jarvis Jones jerseys. The players at Georgia are not being compensated as the Falcons players are, even though both teams rack in thousands of dollars from these players’ jersey sales. 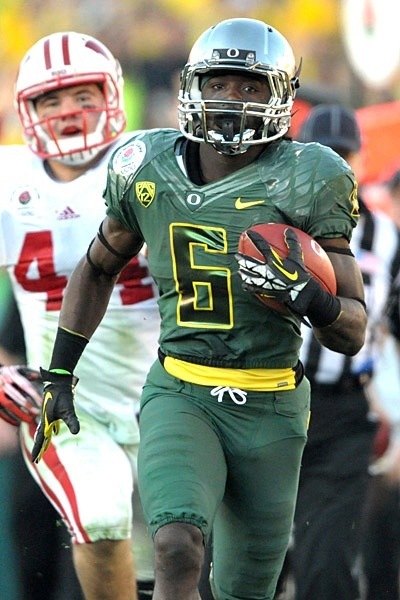 In Nike’s new advertisement for the Oregon Ducks’ new football uniforms, DeAnthony Thomas is being advertised, and Nike is reaping in the benefits. No, Thomas’ name isn’t being mentioned in the ad, but it’s Thomas’ number and self in the ad. How much compensation for Thomas? Clearly the current system is not right. The easiest way for players to be compensated is to pay them a percentage of the merchandise and licensing revenue through anything representing their well-being. It is a lot easier to determine what percentage of jersey sales revenue Thomas brings in for Oregon, but it is much harder to determine what percentage of ticket sales he brings in. A system must be set up that helps these players earn a percentage of the revenue they bring in. They can have a way to put the money aside to keep their eligibility and then have access to the money once their eligibility is up. According to ESPN, a source close to the case told them the new case could bring in “hundreds of thousands” of dollars each year to Division 1 basketball players. The source also said football players, which have a greater number of student athletes compared to basketball, could get “tens of thousands” of dollars. Paying college athletes who bring in huge amounts of money to their universities seems like the right thing to do. Unfortunately, the NCAA has stuck by their amateurism rules very strictly, and the money-makers in this case will fight as hard as they can to go against this case. These money-makers are not going out of business due to this case. EA Sports and their $4 billion will still be making video games. The NCAA with its recent $750 million March Madness contract will be just fine too. The defendants in this case are the NCAA, videogames-maker EA Sports and Collegiate Licensing Co. The plaintiffs, led by former UCLA basketball star Ed O’Bannon, also include Bill Russell, Oscar Robertson and many others. With the money figures the defendants already have and the solid list of plaintiffs, change seems inevitable. Student athletes are now one step closer to being compensated for the use of their images, and it’s about time.